Leang-Leang is a cave in South Sulawesi province, Indonesia, not far from Bantimurung National Park. 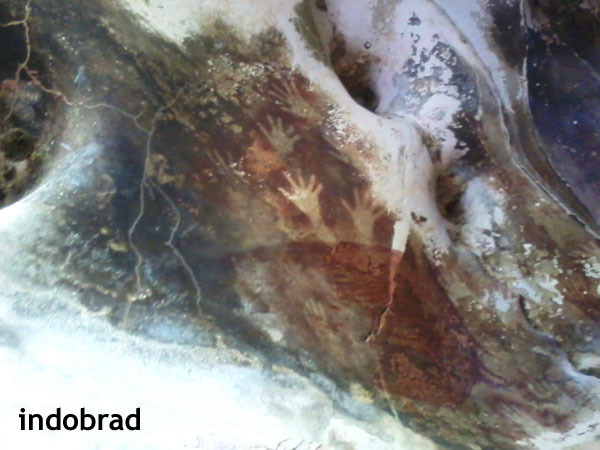 Paintings & artefacts were found scattered around the rocks, indicating the existence of pre-historic civilization. The most important point, though, is up on a hill where hands’ patterns still decorate the wall untouched for thousands of years. This is the best image I could get using a pitiful smartphone camera. I visited Lascaux years ago – I think they have restricted visits now because of moisture from the breath of visitors affecting the cave paintings. It is a wonderful testament to humanity that our art has been part of our essential being for thousands of years. Unlike Lascaux, cave paintings here are located some 10 meters high and you got to climb up the stairs. Even on top of the stairs you still cannot reach it so the condition remains good. Wow! Looks like those hands are trapped, trying to come out from within! Woah. 😮 Hand prints like that! Fascinating though!